Because they couldn’t make Mighty Ducks jokes in the 1980s. I finally got around to playing the Duck Tales: Remastered edition that I first heard about last year. Before I start, I should explain that I approach games like these very carefully, like opening a can of root beer you found on the floor of your car; you can open it if you want, and you may even enjoy it, but you have a better than average chance of something exploding in your face resulting in a mess that leaves you with a sense of utter disappointment. Duck Tales has two problems in this department. 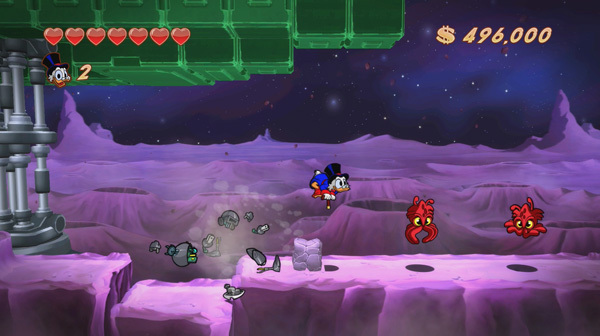 For starters, Disney made it to cash in on the popularity of their cartoon–yes, people still watched the show when this game came out–and game adaptations of movies or tv (much like movie or tv adaptations of games) tend to maximize their entertainment potential when buried deep within the earth (I mean that seriously…look up the Atari ET Game Burial). Fortunately, we dodged that bullet back in 1990, when the game surpassed expectations. Still, the PS3 edition still does something that makes me cringe whenever I hear about it. If you remember the year or two following the release of the PS1, one of the big game publishing trends liked to re-release old Atari or arcade port compilations, usually with only one or two games you feel like playing until you actually buy the game and play them, tossing the disc aside like a torn Kleenex rag. In a way, they did resemble the use of Kleenex, though, since you only pull them out momentarily to interrupt what you really want to do with your time. Yes, I know it sounds weird to devote my time to praising the value of old games, but re-releasing them on high-end consoles just doesn’t make a whole lot of sense. Imagine having the power to render images of 3-dimensional polygons on a 32-bit, CD-based system, and trying to sell the technology with Pac Man. It wastes the capabilities of the console, and let’s face it; you could take a massive dose of Ritalin and get bored with Pac Man after five minutes. One small step for a duck; one giant leap for a duck with a pogo-stick cane. But those collections merely port the games, doing nothing to touch them up visually or to add worthwhile aspects to game play. How does an NES re-make stand up on a console 4 generations after its debut? Not bad, it turns out. The game starts off a little confusing, opening with the original 8-bit midi rendition of the Duck Tales theme used for the NES release. I feel that sends a mixed message–do they want a nostalgic game, in which case why change anything, or will we see how the PS3 can revitalize an old favorite, in which case, why not update the midi? A trivial point, I know, but not half as trivial as my next complaint; why do we always have to push the start button to load opening menus? Doesn’t that just add useless coding to the game? I’ll stop. I swear. Anyway, the game actually works well. They’ve flushed out the story from the NES edition by, well, adding a story. Someone busts the Beagle Boys out of prison, and of course they flock to the one spot in town where they can reliably find a pile of three cubic acres of cash. Scrooge fights his way into his own money bin, fending off the Beagle Boys who have appropriated his Rube Goldberg Brand security system, but finds Big Time Beagle more interested in Scrooge’s new painting than the vault. After delivering a brutal thrashing–as we could only expect would come from a sixty-year old 1%-er who wears a waistcoat, spats, and top hat sporting a cane–he discovers a treasure map inside the picture, leading him to five of his characteristic adventures across the globe. And the moon. 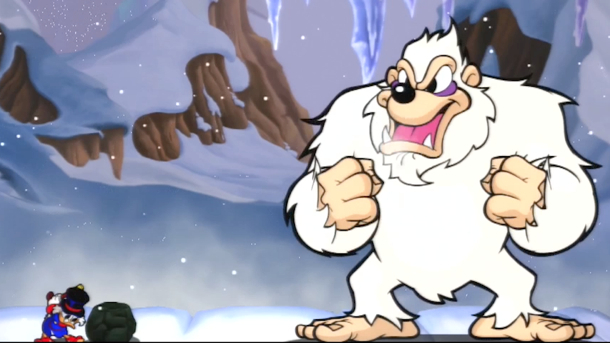 Cut scenes added to the individual levels, however, suggest something sneaky afoot. In case you hadn’t yet figured out that jumping on the monster’s head wouldn’t work. I really can’t say too much against this game–which actually makes it a bad choice to write about on a humor blog. The story they built up around the pre-existing framework actually does what every movie or tv game should strive to do; re-create the feeling of the TV show in an environment immersive to the player. I sincerely have to commend the writers, who captured characterization perfectly, creating conflicts and scenarios that blend in seamlessly from those you’d see in the television series. Most episodes had some character basis for Scrooge’s shenanigans; he’d feel old, so he’d hunt for the fountain of youth, or Webby would rue her life as a little girl, so she’d drink from a magic spring that would make her the size of Queen Kong. This game doesn’t have that; they focus entirely on the adventure. Also, they missed the perfect chance for a Duck-pun in naming the boss of the game “Count Dracula Duck” instead of “Count Drake-ula” or “Count Duckula” (but that one may have had legal ramifications). Otherwise, I can’t complain. Game play loosely resembles the original, but each level has a new layout, and rather than the dash-straight-for-the-end strategy from the NES version, they each have their own objectives that encourage exploration through the entire stage. The bosses come back with a vengeance, adding new attack patterns, making them much more challenging than your average koopa troopa. Also, the game includes a tutorial level–for those of you too inept to figure out a game that uses the D-pad and two buttons–and a new final stage. 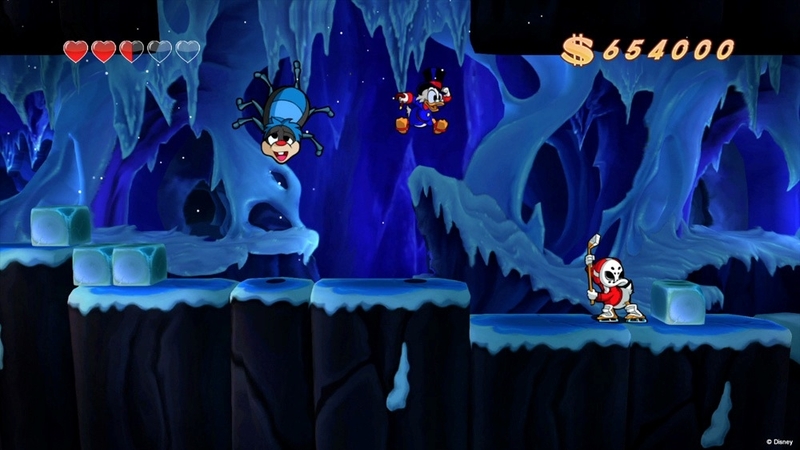 They get rid of all backtracking through the Transylvania level, which didn’t make a duck load of sense in the first place, so the game feels like an improvement. The game’s ended expands greatly from the brief newspaper article of the NES version showing you your score. Instead, the story concludes, the game flashes shots of its concept art, and you get to sit back and enjoy a list of credits so detailed that you learn the names of everyone from the executive producer to the the part-time janitorial staff for the European P.R. department. 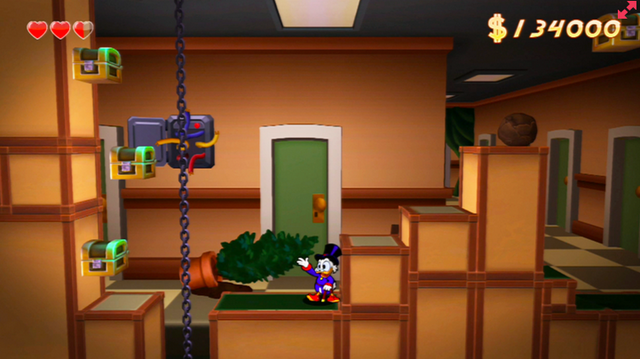 Scrooge’s office building, the money bin. I hear the employees fill the suggestion box with requests for stairs. The gems represented one of the biggest frustrations from the NES version; no matter how much you picked up, you didn’t actually get any richer. You couldn’t trade Scrooge’s fortune for the cost of an SNeS. In the PS3 version, however…you still can’t. But the money goes toward unlockable concept art in an in-game gallery. 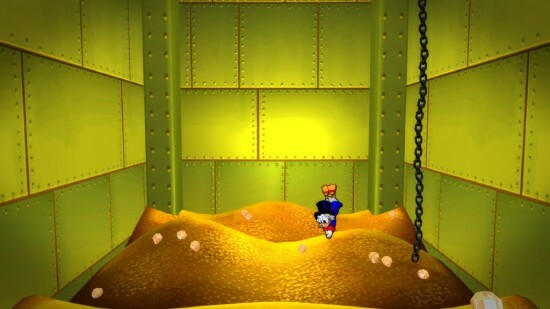 And when you’ve unlocked all the pictures, the money goes toward filling the money bin, which you can dive into and swim through between levels, an activity that will keep you amused for at least the amount of time it takes you to climb back out of Scrooge’s stash. You might even swim a few laps back and forth before your mind drifts off to thoughts of Pac Man. If you thought the water pressure in your swimming pool would crush your ears, try diving to the bottom of this sucker. I didn’t cover the game until now because of the price. I liked the NES version and wanted to play the Remastered edition, but I didn’t know whether the $20 for the disc (or the $16 for those of you who don’t feel compelled to buy a hard copy). I still don’t know if the few hours of play time justified the cost, but I feel like it offers enough reason to replay the game (build up your cash pile) that I don’t mind the cost, and I figure when the NES version came out, I probably paid at least $50. This entry was posted in Disney, PS3 and tagged disney, ps3. Bookmark the permalink.